Search all Lakes of the Four Seasons homes for sale below. BUYING: Are you ready to buy a home in Lakes of the Four Seasons, Indiana? Let us help you. We are Bill Port and Rachel Port of RE/MAX Realty Associates. As Realtors, we have been helping clients buy and sell Lakes of the Four Seasons Indiana homes for 25 years. We know Lakes of the Four Seasons real estate. At the bottom of this page we’ve displayed the most accurate list of available Lakes of the Four Seasons Indiana homes for sale. SELLING: Are you ready to sell your Lakes of the Four Seasons, Indiana home? Maximizing the sales price of your Lakes of the Four Seasons home is what we do best! 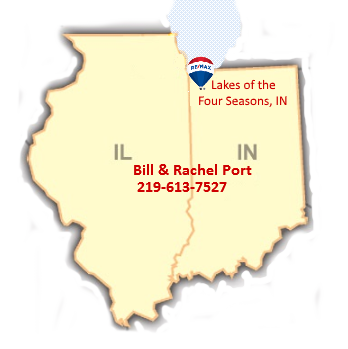 We are your local Lakes of the Four Seasons Realtors, Bill and Rachel Port of RE/MAX Realty Associates. We know what modern buyers are looking for in a home. We make it our job to help you enhance your home to sell for top dollar. We want to be your Lakes of the Four Seasons Real Estate Broker! Marketing homes is a skill. Choosing the right real estate agent can make a big difference when selling your home. We use professional photos, video and Internet Marketing to sell your home. By combining the amenities of your home with the local Lakes of the Four Seasons community our marketing attracts qualified buyers to your home. FREE. Click here for a FREE Home Market Evaluation of your Lakes of the Four Seasons, IN home! Lakes of the Four Seasons (LOFS) is a private, gated community located between Crown Point and Valparaiso, Indiana. Lakes of the Four Seasons is a community with four lakes, a 19 hole championship golf course, and its own private security force. There are plenty of beaches, parks, playgrounds, athletic fields, tennis courts, a swimming pool, and a half mile walking track located at Lions park. LOFS also has two restaurants; Seasons Lakehouse (formerly the Clubhouse Restaurant) 19th Hole Grille, a clubhouse, dog park, and Pro Shop. Many clubs and organizations are active within our gates. LOFS has a professional management staff who oversee day-to-day management and maintenance of the common areas and roads, and an elected board of directors of the Property Owners Association (POA) who prepare and oversee the budget and decide policy. A set of Restrictive Covenants governs construction, maintenance, and general rules of the community through the POA. Search every listed house for sale in Lakes of the Four Seasons on the bottom of this page. Meta -Title Recommendation is 55 characters.